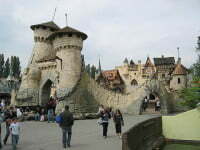 France Miniature is a miniature park that features detailed 1/30-scale replicas of major French landmarks and monuments in a 5-hectare (12-acre) outdoor park in the shape of France. Monuments are placed in the park to correlate approximately with their real-world locations in the country. A system of model trains runs through the park, and animated boats ply the “Atlantic Ocean” and the “Mediterranean Sea” (lagoons positioned appropriately around the perimeter of the park). An indoor exhibition features extremely detailed models of several indoor scenes. In this delicious ride, you will feel giant like Guliver, and kids will have fun to have a general idea (top view) of the monuments, gardens and cities of France, as well as the 50 “doll’s houses” that replicate the interior of famous places. The park also houses an amusement park that kids will love, with a little electric 4-5km/hour cars that children roam on a circuit of 900 m2 that represents France; a climbing volcano that rises to 8 metres; a boat that takes off and lands in the “English Channel” lagoon, among others. Address: Boulevard André Malraux – 78990 Elancourt (35 from Paris) Opening Hours: Click here to see the calendar of opening hours on France Miniature Website.